Today is Father's Day. There is no better time to write about my dad than today. If you've been here before you probably know that I grew up outside of Chicago. This summer I will be making the journey to San Francisco and AT&T Park for the first time in my life. I'll share the details at the bottom. It's all because of my dad. Meet the man that started it all for me. Barry Nathanson was born January 4, 1948 in New York City. This was a golden age for Baseball and he stumbled right in to it. Jackie Robinson had just paved the way for the reason he got hooked. Willie Mays. 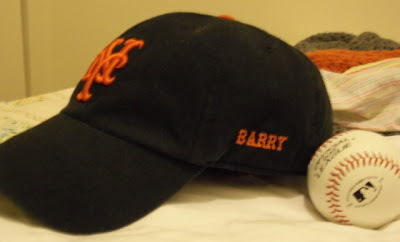 His father, Alexander, rooted for the Giants and my dad followed suit. He was 6 years old when Willie made "The Catch". Dusty Rhodes, Sal Maglie, Monte Irvin were names I knew before Kindergarten. I can still picture the Polo Grounds in my mind as he described it. I see Leo Durocher waving Willie Mays towards the plate when I close my eyes. Baseball is the greatest game ever invented, and my father fostered that love for many people. I'm the lucky one, I got to absorb it all up close. The impact that he had on baseball in our local community was bigger than probably even I realize. Between the ages of 6-15 my dad was the manager of my team 6 times. Five of those we were the Giants. When I wasn't, he still wore a Giants cap in the 3rd base coaching box. Everyone knew of my dad's love. We even won a championship when I was 12 as the Giants. Spraying fake champagne under the lights just might be my top childhood memory. My dad was a great coach. But he really did so many other things to improve the game in our area. Our local program is not a little league affiliated one. We have one that is run by the parents, for the kids. My dad jumped right in. We moved one town over when I was 8. It is a much smaller town and has no baseball league. The kids play in the one I had started in. When the league was growing there was talk of shutting out the surrounding towns because it may get over crowded. So what did my dad do? He ran for the Park District of our hometown so that more ball fields would be built and we would be an asset. He not only got on the board he became President for a good long while. Under him many fields were built on land in our town. He transformed the access players from our area had. So much so that when his first field was used the schedule maker deemed the abbreviation for the field to be BN. Even though the name of the field was Gridley, for the farm that had resided there. My dad deflected the attention. He always did. Personally I thought it was great. My dad was a dentist. An endodontist to be precise. So the health and well being of us kids was also on his mind. He took it upon himself to write to Major League team doctors to inquire about pitch counts. Then after he presented it to the board of our program, they changed the way we looked at pitching rules. Suddenly smarter things were done to protect young arms. He hustled to do everything to help grow and spread our program. For years he would be the one getting local advertisers involved. His last few years on the board he was in charge of fields. You could always see him out at 6am on a Saturday dragging an infield or setting up the All Star festivities. He loved it. I love him for it. There really is more. I could go on and on. My dad is the number one reason I am passionate about baseball and specifically the Giants. I love them because I love him. In 2010 we got to share a championship together. It was long distance, but meant so much. We were never certain that we'd see a Giants World Series win in our shared lifetime. Unfortunately he didn't get the chance to see the boys of 2012 work their magic. My dad passed away shortly before the season started. I've talked about it here before. It's my first time ever going to San Francisco. If my dad's not going to be here anymore, I can't see a better reason to go. I love and miss him very much. He truly made me the man I am today. One day we'll get to watch every Giants game together again. Wow,loved reading this blog ....Go giants! !